It is critical that the design is correct in any heating system and when you are investing in a biomass boiler you want to protect your investment with the best possible design for your installation. Even simple domestic installation to full district heating systems the correct design and biomass installations is the key to success. Most biomass design and installations connected to heating system in the UK will always need a buffer tank, there are a very few acceptations and I would always ask your installer for evidence the Biomass Boiler manufacturer recommends the method of installation. The sizing of the pumps on the systems is important to ensure the correct heat is delivered and also that the stratification of the buffer tanks is not disturbed. If you are looking at Wood Chip Boilers your need to consider were the fuel will be coming from and how it will be delivered as the handling of wood chip is very different than that of other biomass fuels. Pellet Boilers are easy for the day to day running of the boiler but the fuel store size should be carefully sized to ensure you are not waiting in for numerous deliveries each year. A domestic boiler should receive about one more delivery a year than an equivalent oil installation and if there is sufficient space this could be the matched. We hold HETAS 005 qualification for the Design and Installation of Mechanically Feed Biomass Boilers together with plumbing and heating certification. 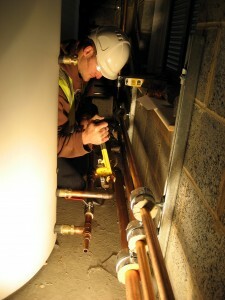 We have fully qualified plumbers to install the hydraulic system of your biomass installation and 17th edition qualified electricians for any wiring requirements of the projects to ensure the highest standard of work is carried out.